Ann and Wade have carved out a life for themselves from a rugged landscape in northern Idaho, where they are bound together by more than love. With her husband’s memory fading, Ann attempts to piece together the truth of what happened to Wade’s first wife, Jenny, and to their daughters. 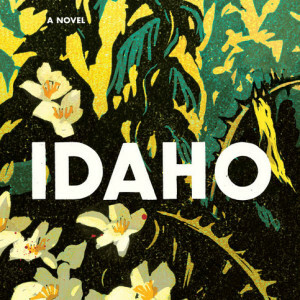 In a story written in exquisite prose and told from multiple perspectives—including Ann, Wade, and Jenny, now in prison—we gradually learn of the mysterious and shocking act that fractured Wade and Jenny’s lives, of the love and compassion that brought Ann and Wade together, and of the memories that reverberate through the lives of every character in Idaho. 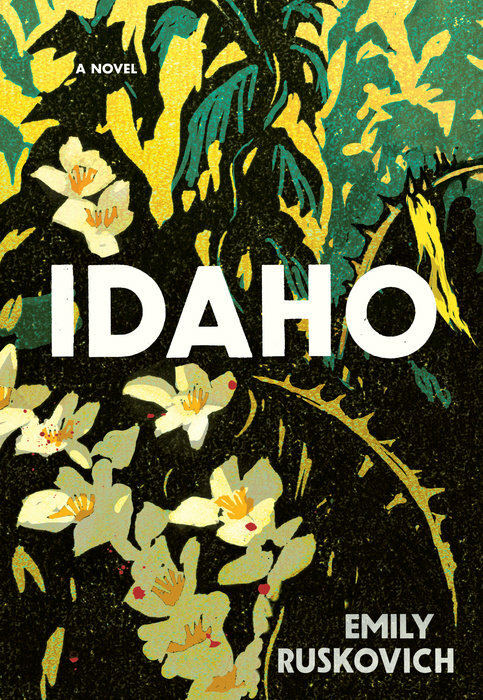 Stay informed about books like Idaho and more from Penguin Random House. They never drove the truck, except once or twice a year to get firewood. It was parked just up the hill in front of the woodshed, where it collected rain in the deep dents on the hood and mosquito larvae in the rainwater. That was the way it was when Wade was married to Jenny, and that’s the way it is now that he is married to Ann. Ann goes up there sometimes to sit in the truck. She waits until Wade is busy, so that he won’t notice that she’s gone. Today, she comes here under the pretense of getting firewood, dragging a blue sled over the mud and grass and patches of snow. The woodshed isn’t far from the house, but it’s hidden from view by a stand of ponderosa pines. She feels like she is trespassing, like none of this is hers to see. The truck is parked on a rare space of flat land, an unlikely shelf carved into the mountainside. In front of the woodshed, around the truck, a few loose bricks lie here and there in the grass and snow. Spindles of mangled wire lean against the trees. Hanging from a long larch limb are two thick ropes that sway opposite each other now, but look as if they might have once been connected by a flat board—­a child’s swing. It is March, sunny and cold. Ann gets into the driver’s seat and shuts the door quietly. She pulls the seatbelt across her body, then rolls the window down so that several droplets splatter on her lap. She touches the wet spots with her fingertip, connecting them with lines in her mind to make a picture on her thigh. The picture reminds her of a mouse, or at least a child’s drawing of a mouse, with a triangle face and a long, curlicued tail. Nine years ago, when Wade was still married to Jenny and both of his daughters were still alive, a mouse had crawled along the top of the truck’s exhaust pipe into the engine compartment, and built its nest on the manifold. She thinks of how strange it is that Wade probably remembers that mouse, remembers the sound of it skittering under the hood, and yet he’s forgotten his first wife’s name. Or so it seems sometimes. But the mouse—­the mouse is still very much alive in his memory. A few years after Ann and Wade married, Ann found a pair of deerskin gloves in a toolbox high on a shelf in a closet. They were much nicer than the work gloves Wade usually wore, and seemed to be brand new except for the odor of something burned. That was how she learned about the mouse in the first place. She asked why he kept the gloves stored in their closet instead of using them. Wade told her that he wanted to preserve the smell. The smell of a rodent’s nest that caught on fire. The last smell in his daughter’s hair. It was a long time ago now that he said things like that. He stopped talking about the details of his daughter’s death once he saw how much Ann held on to them. He probably thinks she’s forgotten about the gloves, it’s been so many years. But she hasn’t. He keeps them in the filing cabinet with his papers, in his office upstairs. She has opened the drawer just enough to see them. That mouse had probably been in the truck the whole winter, during that last year that Wade was married to Jenny, that last year that May was alive and June was safe. Ann thinks of the mouse going back and forth in the snow between the truck and the barn, hauling mouthfuls of hay or insulation or tufts of stuffing from the dogs’ beds, making its nest bigger and having babies in it once spring arrived. Some of the babies probably died early on and were absorbed by the nest, their tiny bones like shards of straw themselves. And other mice came, too; you could hear them moving under the hood if you put your ear against it. The little girls liked doing that. Well, at least Ann imagines they did. One day in August, the whole family got into the truck. Wade at the steering wheel, where Ann is sitting now, Jenny next to him, their daughters, June and May, nine and six, crammed in back with a jug of lemonade and Styrofoam cups, which they carved pictures into with their fingernails. The girls probably wanted to ride in the truck bed, but their mother would have said it was not safe on the highway. So they sat facing each other in the cab with their backs against the windows, bumping their knees, probably fighting. They forgot all about the mice. They didn’t notice anything at first, driving slowly over the dirt roads. But once they reached the highway in their town of Ponderosa, a smell like decay and burning hair, skin and seeds sizzling on a hot engine, entered through the vent and filled the whole cab of the truck until the little girls were gagging and laughing and pushing their freckled noses out their windows. They had to drive on with their windows down, tolerating the smell, for the hour drive through the Nez Valley, past Athol and Careywood, then up the long road nearly to the top of Loeil, the mountain where the birch wood was already cut and piled, ready to be loaded. Their hair and clothes, and Wade’s gloves, held the burned smell in their fibers. Ann pictures June and May. They wait in the sun while their mother rolls the birch logs onto the truck bed and their father stacks them there. The girls lean against the tires, slapping horseflies on their legs, pouring lemonade into the dust. The smell would have been there on the way back, too. It is the one constant. It connects two things in Ann’s mind that she can’t manage to connect otherwise—­the drive up the mountain and the drive back down. The drive back down is the part Ann comes here to try to understand. There would have been things Wade had to consider, before he could take control and go for help. Practical things. Shutting the tailgate, for example, so the logs wouldn’t roll out. He would have had to remember to hold the handle up and then push in—­there was a trick to it—­in order to lock the tailgate. That he would remember, that his fingers could do what they were supposed to do even in the midst of his horror, has something to do with the reason Ann loves him. One day, perhaps, everything will be gone from his mind except the trick of the tailgate latch, and Ann will love him still. She thinks of how easy it would have been to get lost on the way back down, since they’d gotten lost so badly on the way up. How could anything have looked familiar? The narrow, grassy roads. The crudely made road signs nailed to trees: That he had read them an hour before seemed impossible to her. All of it seemed impossible. The summer sky, the snapping of twigs under the truck’s tires. The smell of grease and honeysuckle. Jenny’s breath fogging the window. Ann has had to imagine most of it, everything beyond the facts Wade told her or she heard on TV. She did try very hard during those early days to keep the radio and TV off, so that everything she knew she knew from Wade. What Wade wanted to tell her, she would keep. But she wouldn’t let herself go searching; she wouldn’t let herself ask. But all of that is different now that Wade is forgetting. She wants to ask him if he and Jenny spoke, before his memory is lost for good. Did Jenny look out the side window or straight ahead? Or did she look at him? At what point did he rip down the rearview mirror? No, Ann thinks, it isn’t even the drive back. It is his getting into the truck at all. Opening the door and getting in. Jenny there with the cup of lemonade shaking in her hand—­or maybe not shaking, maybe perfectly still. Maybe the cup empty. Maybe the lemonade spilled on her lap like the droplets of water now on Ann’s thigh, in the shape of something harmless, something that the child in the backseat might have drawn. Ann runs her hand over the dashboard and the soft, moist pollen of last summer sticks to her palm. It is all put together for her, here. The rearview mirror is up again, glued in place, and there’s a dream catcher thrown around it, with two fluorescent feathers hanging down. The carpet has been shampooed, the right backseat replaced entirely, with one that looks like the original on the left, only a brighter shade of blue and missing the little holes where the stuffing came out and where the girls might have once stuck their fingers. Ann turns the key to let the engine run while she sits here. She breathes deeply. Nine years and the smell of the mouse’s nest is gone, but every now and then, when she shifts in the driver’s seat and the dust rises from the cushions, she catches what might be the hint of that old smell, distant and thinly sweet, leather and burning grass. Though of course it could also be the controlled spring fires down in the valley fields, far away. Ann and Wade have been married for eight years. She is thirty-­eight now, and Wade is fifty. Last year, Ann found a box of Wade’s old shirts in the attic. She brought the box downstairs and sat on her knees in a warm square of sunlight on the floor. She unfolded the shirts one at a time, held each one up, and placed some in a pile for the Salvation Army and some in a pile to keep. Wade walked into the bedroom and saw her doing this. “Is this too small?” she said. She didn’t turn around because she was trying to decide about an oil stain. She was holding the shirt up above her, to see the light shine through it. Wade didn’t answer. She thought he hadn’t heard. She folded the shirt and moved on. But the next thing she knew, Wade was pushing her head down, pushing it hard, into the box of clothes. She was so shocked that at first she laughed. But he didn’t stop. The cardboard edge rubbed against her throat, and her laugh became a gasp for air and then a scream. She clawed at his legs, thrashing blindly. She pounded her fists on his shoes, jammed her elbows into his knees. He was speaking to her in a voice she recognized—­she couldn’t think from where—­but it was not a voice he’d ever used with her. “No! No!”—­almost a growl. His dogs. He used that voice to train the dogs. Then he let her go. He stepped back. She lifted her head, slowly, with caution. He sighed deeply, then he touched her shoulder as if to ask for her forgiveness, or—­this occurred to her even in her shock—­to offer forgiveness to her. After a minute, he asked her if she’d seen his mowing shoes. “No,” she said, staring into the box of clothes. She sat on her knees, shaking, smoothing down the static in her hair, over and over again, as if that would make a difference. Wade found his shoes, put them on, went outside. In a few minutes, she heard the tractor. Wade was clearing the knapweed from the pasture. But the day he pushed her into the box of clothes was something very different; it was the only time his disease manifested itself in violence, violence so far removed from the man he was that Ann couldn’t fathom such a thing happening even in the moments that immediately followed. But after it happened once, it happened again. A few months later, he pushed her against the refrigerator, so that her cheek pressed against a coupon she’d hung there, for a diner called Panhandler Pies. She fought him, but just like the first time, fighting only hurt her more. When he let her go, she pushed him away from her and screamed at him, but he just stood there sadly, as if disappointed in her. Another day, not too long after that, Ann poured a bucket of pinecones onto the kitchen table. She intended to decorate them with peanut butter and birdseed, to hang on the tree limbs for the finches. But as soon as she sat down to work, she felt his hand on her head, and he pushed her down into the pinecones. The pinecones left a rash of tiny cuts on her left cheek. She did not understand these things, but knew that Wade didn’t understand them, either, and so she found no way to express her anger. No way to stop these episodes from happening again. The pain and the shock of them wore off the more they happened, and she began to bear the assaults because she didn’t know what else she could do. She took note of what provoked him, and made sure never to do those things again. No more pinecones, no Panhandler Pies, no boxes of old clothes, no going in his daughters’ rooms. Simple enough. These things were a kind of collection she began to keep, a list she would run down in her mind, eventually not out of pain anymore but out of wonder, as if something were right there on the edge of her life, waiting for her to discover it. At night, when he was asleep, she thought about these things as she studied the face she loved. His pale eyelids stark on his sun-­roughed face. His lips chapped, his cheeks unshaven. Such inherent kindness in his body that it was impossible to picture this man doing the things he had certainly done. She touched her lips to his thick hair, and she closed her eyes, too.